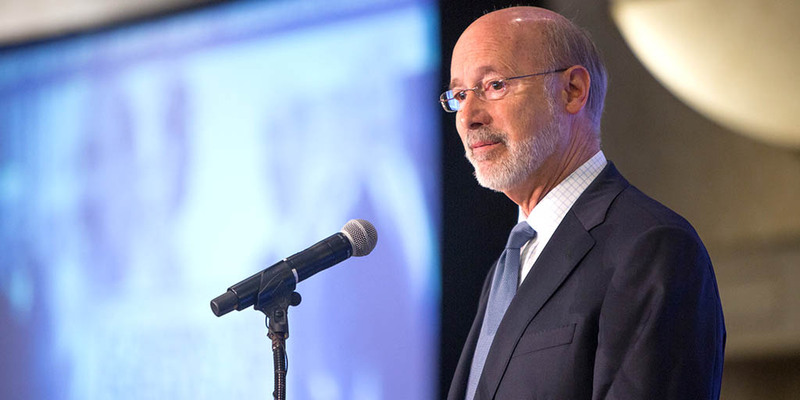 Scranton, PA – Governor Tom Wolf today participated in “A Conversation with the Governor” hosted by the Greater Scranton Chamber of Commerce in partnership with the Wilkes-Barre and Pittston chambers. More than 200 chamber members and guests attended the event held at the Geisinger Commonwealth School of Medicine. “We’ve worked hard to make Pennsylvania a better place to build and grow a business, a better place to get a thorough and efficient education, a better place to live and work, a better place to grow old, and a better place to grow your family,” Governor Wolf said in his prepared remarks. President and CEO of the Greater Scranton Chamber, Bob Durkin, served as moderator for the question and answer session that followed the governor’s remarks. Dr. Steven J. Scheinman, President and Dean of Geisinger Commonwealth School of Medicine, and EVP and Chief Academic Officer of the Geisinger Health System; and John P. Wiercinski, Regional Vice President for Gesinger Northeast, joined the discussion that focused on workforce development, education, and health care, among other topics. Completing more than 180 projects with the Governor’s Action Team, securing commitments of more than $8.9 billion in private investments and the creation and retention of 84,000 jobs statewide. An estimated 60 percent of these jobs were created in manufacturing and manufacturing-related sectors. Increased participation from 725 registered apprenticeship programs and 13,282 registered apprentices to 746 programs and 15,023 apprentices. Helped small businesses invest in real estate financing, equipment loans and lines of credit for more than 173 projects has led to more than $350 million in private investment and more than 5,800 jobs created or retained. Supported 126 community revitalization projects including streetscape and facade improvements to spur business development and quality of life in Pennsylvania’s downtown districts. Recapitalized the Business in Our Sites program through the reallocation of funding from underutilized programs to grow Pennsylvania’s inventory of pad-ready sites for business development. Cutting red tape for small businesses by creating a one stop shop for state resources. “I am incredibly proud of these accomplishments, which will make a difference for people and communities across Pennsylvania, and I am also proud of the work we’ve done to support our local businesses and to strengthen our regional economies.